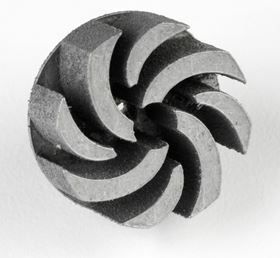 An impeller made using Nanosteel’s range of PM for 3D printing. The company can also now customize properties layer-by-layer using gradient material design. Nanosteel says that it has recently print a bearing and impeller using the powder bed fusion process. These parts were measured to be fully dense and crack-free, with hardness levels >1000 HV. Building on this, the company used a combination of high hardness and ductile alloys to create a part featuring a gradient design. NanoSteel worked with the Connecticut Center for Advanced Technology to generate part samples using freeform direct laser deposition. This single AM process achieved a transition between the hard and ductile properties without subsequent heat treatment. The powders are suitable for making 3D parts for tool and die, energy, auto, and agriculture applications.